“Hot! 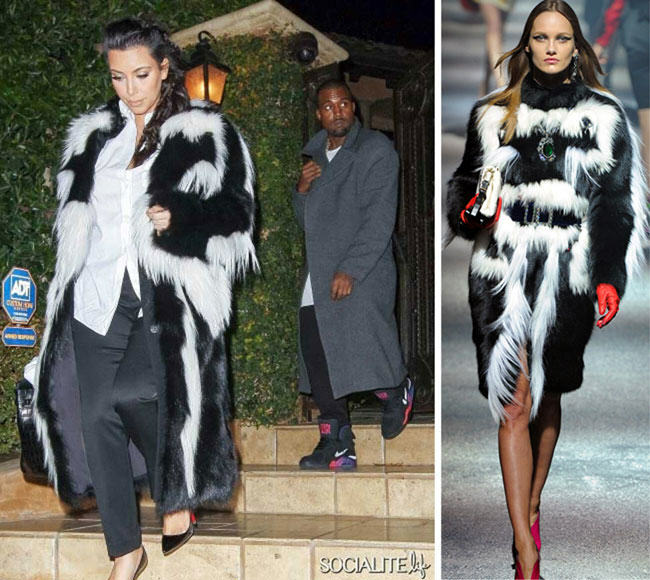 or Hmm…” asked Fashion Bomb Daily when Kim Kardashian stepped out in a full-length skunk coat from Lanvin. It’s durable, warm, glamorous and striking. 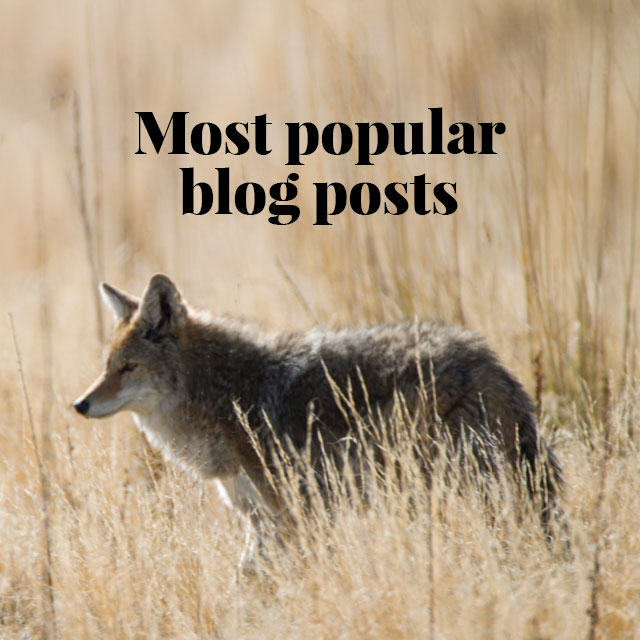 And it comes from an animal that is abundant in the wild, easy to trap, and easy to farm. In short, all the right boxes are checked for a great fur. It was also once the height of fashion. Yet today it’s rarely seen in stores, and a pelt sells for the price of a coffee. This is the conundrum that is skunk fur. Are the fur trade and consumers turning their noses up for no good reason? Let’s start with the end product. Skunk fur is durable – less durable than beaver, but ahead of the pack and on a par with mink. Skunk fur is warm. It’s no caribou, but unless you live in the Arctic, it’ll work fine. 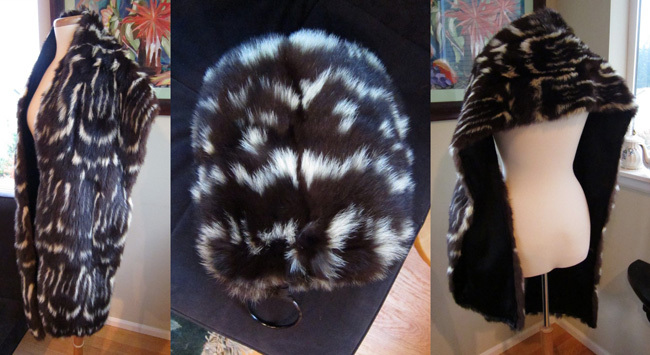 Skunk fur is glamorous and striking. The guard hairs are long (1-2″) with a glossy lustre, and are held erect by thick underfur. And the colouration is unmistakeable: deep brown or black, usually with white striping and cream patterns. The most prized pelts have solid black backs with a blue sheen, and come from colder regions where pelts are thicker, hairs are finer, and the black is blackest. (No fur is blacker than northern skunk.) If there is one white stripe, and it’s long and wide (hooded skunk), this may be retained in a garment, while pelts with two stripes (striped skunk) are normally dyed a uniform black. So what’s the downside? Not much. The guard hairs are slightly coarser than fox, the most luxurious long-haired fur. Skunk fur is reputed to have an odour, especially when wet, but this should not be a problem today. Using proper trapping techniques, it is rare that an animal sprays. And even if there is a slight vestigial smell, a skilled fur dresser can remove it. And last, but perhaps not least, it’s called “skunk”. So how easy is it to produce skunk pelts? Pretty easy. Let’s start with trapping. First, skunks are abundant. The striped skunk, the most commonly traded species, has a conservation status of “Least concern” with the International Union for the Conservation of Nature. It ranges from southern Canada to northern Mexico, co-exists with humans, and in many parts of its range is growing in numbers. Second, skunks lack caution and cunning. A box trap works great for nuisance skunks, but is too costly and bulky for fur trapping. Foothold (restraining) traps or bodygrip traps are better. 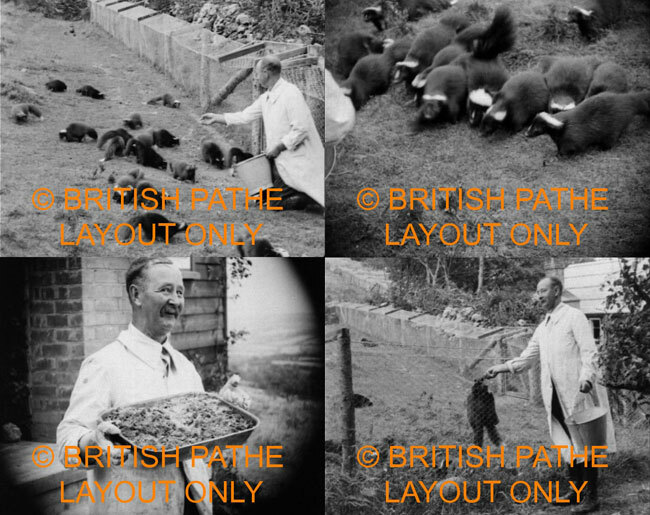 This unique film footage shows an English skunk farm in 1931. Note how selective breeding has removed all white striping from the animals’ backs. For the history of this farm, read here. Farming skunk is also easy. Indeed, skunk farms were once seen as a stepping stone for beginners looking to graduate to more challenging and valuable furbearers. Reasons why farming is easy include: Skunk are easily tamed, and at feeding time just come running. They’re poor climbers and have few natural predators, so pens are open-topped. They’ll eat just about anything – table scraps are fine. And selective breeding produces all-black skunk in just three or four generations. So why aren’t we all dressed from head to toe in skunk fur? Its curious history may shed some light. For the longest time North Americans had no interest in skunk fur, but it wasn’t a case of singling it out. They weren’t crazy about fox either. And even when skunk was “discovered” in the mid-1800s, demand was not at home but from Europe. Skunk quickly became America’s second most valuable fur harvest after muskrat, with almost all pelts being traded in London and Leipzig. To meet demand, the first farms emerged in the 1880s, but unreliable pelt prices forced most pioneers to close. Then the farms sprung up again at the turn of the century as European demand surged. In 1911, pelt sales in London peaked at just over 2 million. And that’s how things stayed right up to World War I. The domestic market remained tiny, a fact historians attribute to a lack of Europe’s deodorising skills. Or perhaps it was that American dressers had to work with pelts so pungent, European brokers wouldn’t take them. Whatever the case, World War I changed everything, not just for skunk but the entire fur trade. With shipments to Europe disrupted, the age of major American auction houses began, first in St. Louis in 1915, then in New York in 1916. 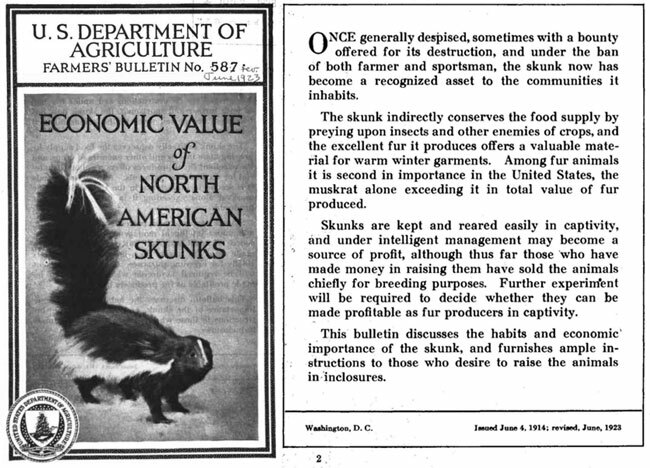 “Skunk fur is intrinsically of high value,” stated the US Department of Agriculture in 1923. Demand for skunk in North America finally took off, and when the European market came back on stream in 1918, the golden age of skunk had arrived. Skunk trapping also helped countless rural families weather the Great Depression, mailing their pelts to Sears, Roebuck in return for a check or store credit. 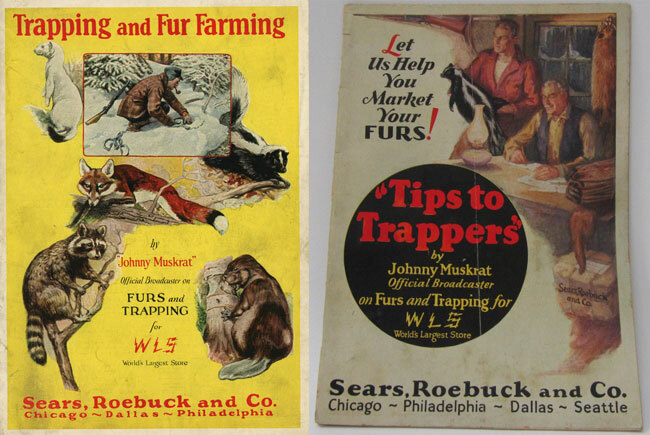 Through its annual newsletters and radio shows, Sears (aka “Johnny Muskrat”) created a whole new generation of trappers, and became one of the largest fur buyers in the US. Sears, Roebuck grew as a mail order business serving rural communities, and those same communities sent it their furs. During the Depression, skunk figured large in its educational materials. And then the age of skunk was over. World War II ended and fur fashion shifted dramatically. Long hair was out and short hair was in. Skunk pelts were almost worthless, red fox pelts were “unsaleable”, and even silver fox was scorned. Mink was the new king, a position it has not relinquished to this day. But a change in fashion was not the whole story. If it had been, skunk would have rebounded along with fox, which still has a loyal following today. Some observers blame skunk’s demise on stricter labelling laws. In the 1930s, the fur trade often took considerable liberties when it came to labelling. Women of all social classes wanted fur, but with the Depression raging, few husbands could afford the premium stuff. What they could afford was humble rabbit, but that didn’t sound very glamorous. Enter creative marketing. “Minkony” was rabbit dyed to look like mink. “Ermiline” was white rabbit, sometimes with black spots for that authentic ermine look. Then there were totally fictitious species like “Baltic black fox”, “Belgian beaver”, “French sable” and “Roman seal” – all rabbit! Other furs got the creative treatment too. “Hudson seal” was one of the most popular sellers, though it was actually sheared and dyed muskrat. And no fur, of course, needed a new name more than skunk. Why tell Ma’am she was swathed in the skins of foul-smelling critters when you could sell her “American sable”, “Alaskan sable” or “black marten”? Finally the US Federal Trade Commission cried foul. From 1938 on, the true identity of the furbearer had to be given, though the name of the animal being imitated could stay. Goodbye “American sable”, hello “sable-dyed skunk”. Skunk fur stole and muff, circa 1940s. These are natural black with dark brown undertones and cream patterning. The muff is lined with black satin and stuffed with down feathers. From the Lady Violette Vintage Fur Collection. The trade resisted, and some unusual new names were approved. “Rock sable”, for example, became “bassarisk”, even though most people called them ring-tailed cats. But it spelled the end for furs like “China mink” and “Japanese mink” (both weasel). As for skunk, in a few short years it had gone from being “American sable” to “sable-dyed skunk”, to plain ol’ “skunk”. Was it too much for consumers? Are we really that shallow? Apparently yes. A rose by any other name does not smell as sweet! The last skunk fur farms closed decades ago, and offerings of pelts at auction today are small. Prices, meanwhile, seem frozen in time. The largest seller today of skunk fur is North American Fur Auctions, in Toronto. At its wild fur sale last June-July, 2,332 pelts were offered (compared with 310,667 muskrat), of which 70% sold. Average price was $5.97. In February 1920 in St. Louis – that’s almost a century ago – skunk pelts brought an average of $5.14. In today’s money that’s $61! From time to time, skunk has made small comebacks. In the early 1970s, in particular, it was considered quirky and cool, but it soon went the same way of Afros and bell bottoms. Popular designers and fashion houses are still willing to give skunk a try. Just recently, America’s darling of the gossip columns, Kim Kardashian, caused a stir when she stepped out in a fabulous skunk coat from Lanvin. Can Kim bring skunk in from the fashion cold? Or will it remain forever sealed in a 1930s time capsule? Could a kick-start campaign bring this remarkable, but under-appreciated, fur back into the limelight? What do you think? warmth clothes ! It’s disrespectful!!! And while I’m on my soap box controling the populations of wild animals is nessacary for controlling disease in the populations that can pass to humans, livestock, domestic dogs and cats, and kill off while herds not just a few! Not to mention culling out excessive males that kill young, and breed females to an early death or make populations so inbred they cause more disease and generic defects! I love animals wild and domestic. I wear fur killed by me for food both farmed and hunted. I believe in animal well being such as clean living enviromets, good food, treated with respect, I am a tree hugger….however I also have enough education to understand you have to treat them with respect in their life and in their death whatever the reason! You have to control populations to help control negative outcomes in those populations! Wake up people. to utilize! Get off your high horses and grow up your God put animals here to clothe, feed, protect, and help and or guide you whatever your religious beliefs. I don’t judge… stop judging others and thank them for caring enough to use fur and all other parts of plants and animals instead of creating more pollution with harsh chemicals to make fake fur and materials. Love all gods creatures, show them respect in life, death, dispatch practices and use what they give you with respect, pride, and honor! I think skunks are amazing, intelligent, and unassuming animals that don’t deserve to be valued just on whether you can make a coat out of them or not. In that Department of Agriculture booklet it said they used to be kept in barns to keep down the mice. They eat a lot of insect pests too. Plus the only reason there are plenty of them is that they weren’t hunted to extinction levels because they were worth some money like many other species. We didn’t intend to suggest that the only value of a skunk is in its fur. Sorry if you got that impression. As for their high numbers today, a major reason is that they are very good at adapting to the presence of humans, as are raccoons and coyotes. Over-trapping of some species historically has indeed presented problems, but they are all on the way to recovery today. In fact,beavers are believed to be more numerous today that at any time since European colonisers arrived. We need not think. These animals have a nice coat, they dress us well. The new winter fashion proves us, skins are more and more fashionable. What are you, the son of Cruella deVille? Who the hell needs to wear ANY kind of fur, let alone skunk fur? Skunks are mild-mannered sweet little mammals that only want to be left alone. I guess that’s too much for you to do, huh? Jesus. Do you really want people to start skinning skunks again? What is wrong with you? YOU NEED A LESSON IN MANNERS. God is utterly irrelevant to this discussion, and has been for at least several centuries since this thing called “secularism” was invented. There are some places where wearing fur is still the best and only reliable way of staying warm, but the majority of Europe and the Americas are not among them. Wearing furs is purely luxury, and it has no place in fashion the same way animal testing for cosmetic use has no place in cosmetics. As a civilisation, we have outgrown this. We need to start taking care of our animals instead of killing them for our whims. 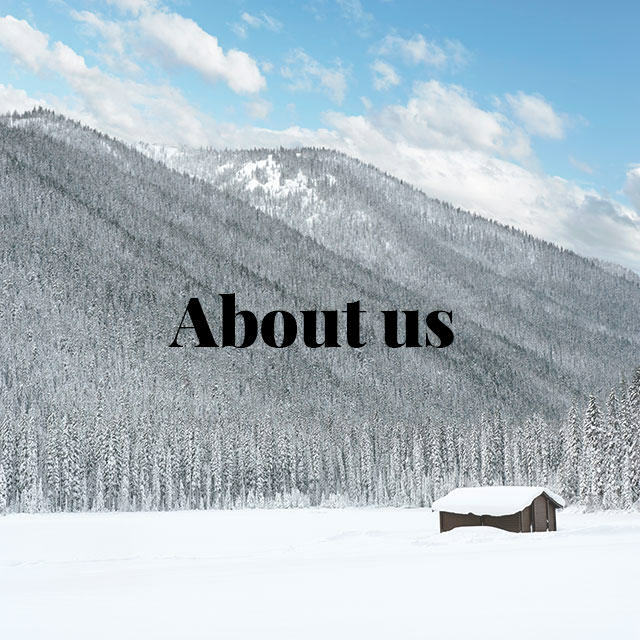 This isn’t always easy, or even possible (or veganism would be more widespread than it is), but with clothing, at least, we’re good at making things that both keep warm and breathe. Even on the natural side of things, we have a wide variety of sheep and camelid species that can be shorne with no loss of life, and produce warm, amazing wool. On a side note, it’s incredibly hilarious that “SJW” now includes “anyone with a concern for the sanctity of life”. You want to enjoy the beauty of furs? I can’t stop you, but at least stop making excuses for yourself, especially ones as flimsy as to involve Jesus. “I like wearing furs and I honestly don’t care enough about animals to stop wearing something that makes me happy.” Just say that and cop to it. I can understand it, even if I don’t share that stance. Genesis 3:21. God made clothing from skins. First chapter in the Bible. God was the first furrier. He didn’t see a problem with wearing fur and did it him/her self. I don’t see a problem with wearing fur. And as the Old Testament of the Bible is the basis for other religions all well (Judaism and parts of the Koran reference the Old Testament also), other religions don’t have a problem with the wearing of fur. I absolutely loved your article on skunk. It was totally fun to read and thorough. I’m Thom Olson. I work at Harper College in Chicago and am currently working on a book on fur design. 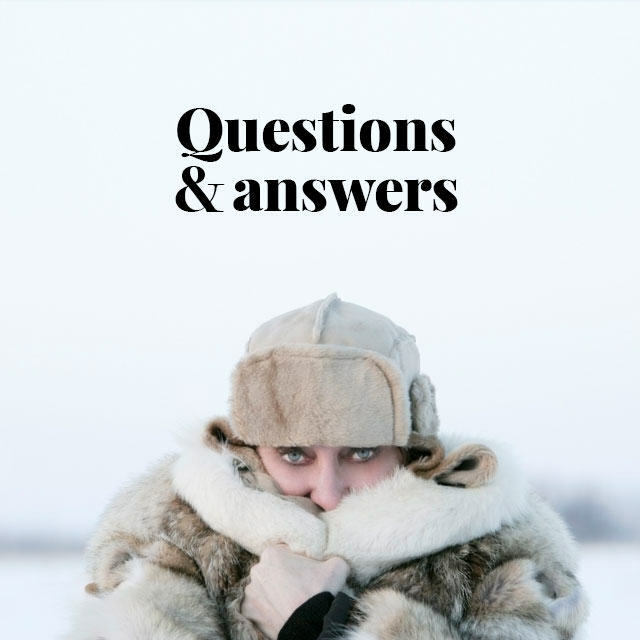 May i reprint your article as a sidebar in the book’s section about fur types? You will absolutely get full credit for it. I could not have told the story about skunk better. I like this coat well and some fur accessories I of this animal, a fur will follow. I look forward to it. I like the 30 years he, furs were worn in honor. If this fur starts to regain popularity, maybe we’ll see PETA creating a video of a skunk being skinned alive. That should be interesting…. I hope it’s their CEO doing the skinning.